Can you imagine having a friend or knowing a teacher serving at a war overseas? This was the tragic and tough reality for the Vic High students and staff from 1914 to 1918. You may have seen the bronze memorial or the Roll of Honor in the main foyer of Vic High with the names of students and teachers who went and fought in World War 1, but they are not just names; they were people whose histories have evolved into memorable stories. As August 2014 marks a century of the beginning of the Great War, now is the ideal time to let the Vic High community know and remember the involvement of Vic High’s teachers and students who left their family and friends to fight and help overseas. Vic High has a rich history and a dedicated Archives team who has taken the time to keep it alive. This project will encourage people to learn more about the school’s connection to World War I, to remember and honor those who gave their lives fighting and those who came back changed. We hope that this project will also make the Vic High community more aware that they are part of the oldest and most historical schools in Canada. 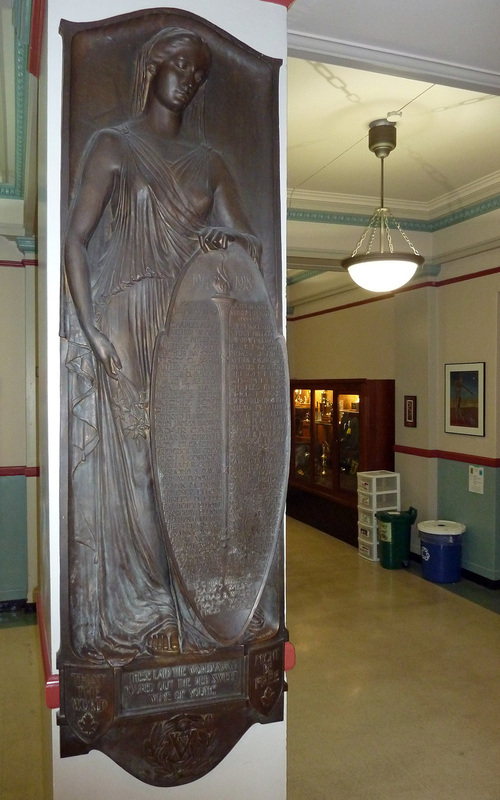 Bronze Roll of Honor plaque: foyer, Victoria High School.